It is not a secret that there were numerous film interpretations of Stanislav Lem’s famous book Solaris. They appeared because of the book’s immense success in the field of science fiction. However, the reader may find Soderbergh’s film (2002) slightly different from the original due to the presence of distinctive features that seem to renew the matter concerning Solaris. Therefore, the purpose of this essay is to shed light on the differences between Lem’s and Soderbergh’s versions. To start with, Soderbergh (2002) focused on Lem’s book but created an image of Solaris with different accents put as compared to the author. Possibly, it is due to the marvelous role of George Clooney and his love affair with his dead wife. In general, the book’s tone is rather disturbing, full of alarm signals and mysterious atmosphere. It seems that the main purpose of Lem was to show the daily encounters of human beings with their memories and sub-consciousness as indispensable parts of everyone’s life. On the contrary, Soderbergh’s film (2002) concentrated on the deep feelings and emotions, thus giving the multi-leveled prose of Lem new shades of meaning. 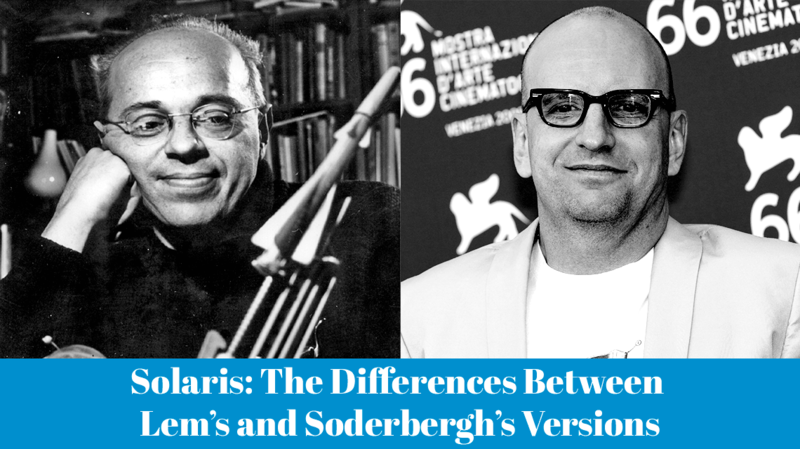 In addition, it is reasonable to take into account Solaris planet as a focus and determine the differences between Soderbergh and Lem’s versions. In the book, one might encounter Kelvin’s interactions with the alien ocean, while the film always shows the planet on the background with its dazzling beauty. In contrast to the literary work, the movie represents quiet depth of the planet, and the spectator is free to interpret its nature. Nevertheless, Lem introduced Kelvin’s interplay with the ocean, pointing on the fighting nature of human beings in unpredictable circumstances. Therefore, the distinctive features that made the film differentiate between two genres can be justified because the film depicted a fight within a person, while the book tended to visualize it. Apart from Solaris as a planet, it is worth mentioning Rheya and the deviations of the film concerning this particular character. To make the story more tragic, the scriptwriter used the matter of abortion that resulted in the quarrel between Kelvin and Rheya and led to the breakdown of their relationship. The heroine committed suicide due to these circumstances; it is the reason why Solaris created the so-called “mirror” converting her into Kelvin’s “visitor.” Furthermore, the relationships between the main characters are depicted in the flashbacks. The film recurred to the moments when Kelvin and Rheya met: it demonstrated their happy moments as well as the reasons for breaking up. In the context of Lem’s interpretation, one may find the circumstances of Rheya’s death in the conversation between Kelvin and Snow. And yet I lived in expectation. Since she had gone, that was all that remained. I did not know what achievements, what mockery, even what tortures still awaited me. I knew nothing, and I persisted in the faith that the time of cruel miracles was not past (Lem, 2002, p. 204). From the above-mentioned abstract, it is clear that the situation that occurred bewildered Kelvin. The readers may choose the ending themselves. On the contrary, the film had a happy ending where Rheya and Kelvin reunited. However, it is rather blurred due to the reason that Kelvin did not know whether he was alive or not. Accordingly, the ending is a vivid difference between the film and the book. In conclusion, it is apparent that considering Soderbergh’s interpretation of Lem’s book, one may find a variety of distinctive features. However, the films and the books in general are marked with different levels of expectations from the readers and the spectators. This fact justifies all the deviations from the book that the film presented making it remarkable in cinematography. Lem, S. (2002). Solaris. (J. Kilmartin & S. Cox, Trans.). San Diego, CA: Harcourt Brace & Co.
Soderbergh, S. (Director). (2002). Solaris [Motion picture]. USA: 20th Century Fox Home Entertainment.